While we tend to cover a lot of popular co-op games on Co-Optimus, there's a whole indie scene where cooperative gaming is just as popular. Xbox Live has their Indie Channel, we're starting to see iPhone titles pop up as well, but the place where this movement is most evident is on the PC. This week we take a look at a small title from developer ItBGames called Kino One. Kino One has great attention to detail right from the start, you can see the developers really wanted to convey a certain style and atmosphere to the game. The first screen you are greeted with is an 8-Bit Department of Justice Seal and a don't do drugs message. This was something that was popular back in the 1980's in arcade games, so it's definitely a nice touch. This not so serious theme is carried into the game's story, which uses over the top voices and MANGA style animation. The story has something to do with an intergalactic battle between Dr. Wiley (Mega Man) and the evil King Zarkon from Planet Doom (Voltron). At least, that's what they look like. But stories never matter in a game like this. 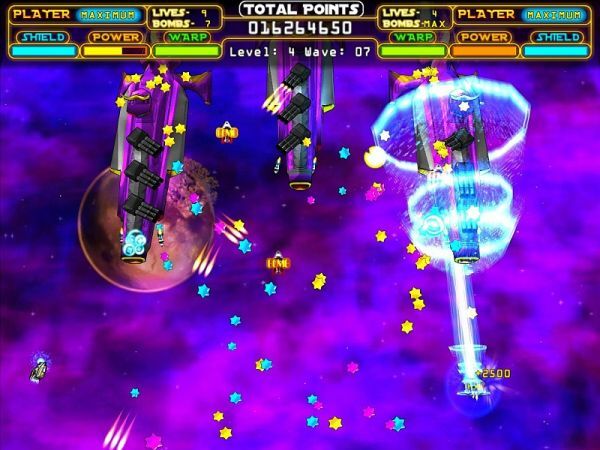 Kino One is a traditional style SHMUP game. You'll be dodging bullets, picking up weapon upgrades, and firing bombs all while trying to get the most points possible. Kino One does do a few unique things here though to deviate from the traditional path, which may otherwise lead to boredom. First - there's no one shot one death thing going on, instead you have a shield which absorbs bullets and can recharge while not getting it. There's also a "warp" meter which allows you do turn invisible for a brief period avoiding all incoming fire. Finally while your main weapon upgrades with faster firing and missiles, it also upgrades your laser which can be charged up by holding down the attack button. 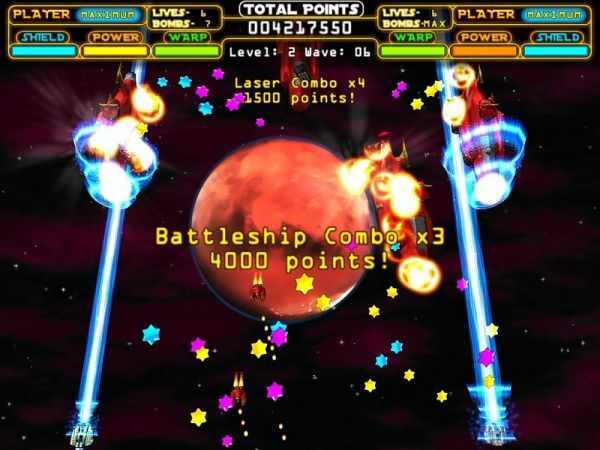 The laser actually adds a level of strategy to the game by providing a combo system to maximize points. This becomes especially evident during co-op where the combo multiplier (and score) is shared between players. We found it worked best to each cover one part of the screen, and then communicate our laser attacks. I found Kino One to be pretty substantial in length for the genre, with 5 levels with 10 waves each. Each level should take you around 15 minutes to complete putting the game well over an hour. A nice touch is the ability to stop and resume at any time, as well as having your co-op partner jump in and out. Ironically Kino One is offered in a package of 6 games set in an "arcade." While Kino One is main game, there are other offerings of classic style games with their own style. You have an Asteroids Clone, a Space Invaders Clone, as well as an Arkanoid clone. For an independent game Kino One really stands on its own quite well, the graphics are decent, the music is addicting, and it's simple enough for anyone to enjoy. On top of the excellent presentation you get a whole slew of games packaged in for only $5. If you're interested in Kino One hit up the game's official website to find out where you can purchase it, or its soundtrack. Page created in 0.9283 seconds.